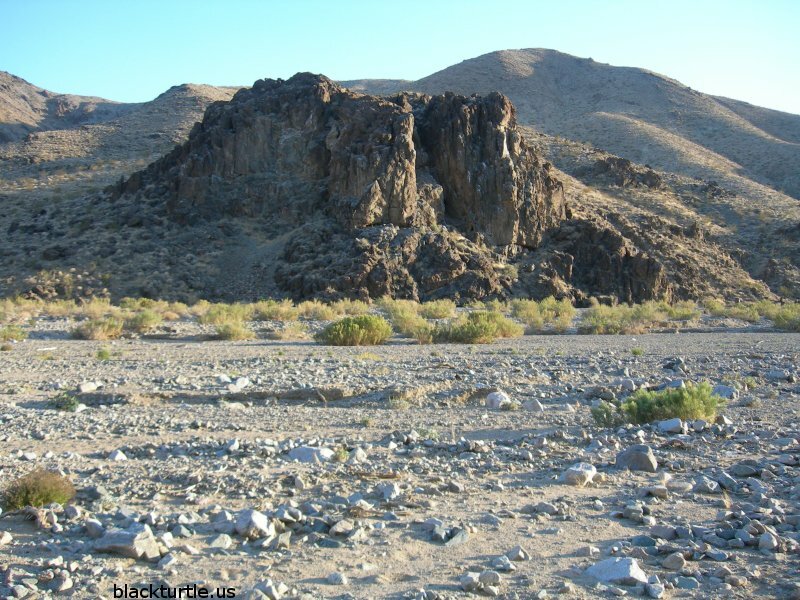 The starting point for this hike is only about a half mile from Trona Road (Highway 178), near Slate Range Crossing. The route follows an old road (which gradually transitions into a donkey trail) up an unnamed canyon to the ridge over-looking Water Canyon. From there the donkey trail drops into the canyon. Next the route continues down the canyon a mile or so to a side canyon which climbs up to the ridge near the McDermott Marker, located next to an old onyx mine. From there follow the road back to the starting point. TRAILHEAD: This loop hike can start from a number of convenient pull outs located along P105 and P2 to the west of Slate Range Crossing. In order to keep track of hiking distance, a fixed starting point will be defined. Turn west onto P105 from the highway approximately 1.2 miles north of Quarry Road. At a half mile from the highway notice an unmarked road which continues to the west, but drive another two-tenths of a mile beyond this road to an unmarked primitive camping area and park your vehicle. The elevation at this location is 2650 feet. HIKE DIRECTIONS: Begin by hiking south less than a quarter of a mile to the unmarked road mentioned in the trailhead directions. Turn west and follow this road towards an unnamed canyon. At approximately 1.85 miles a mine shaft is encountered on the north side of the road. Although timbers are visible from the road, you might not notice it if you're not looking for it. At about 2.15 miles the road passes right by a tunnel and tailings pile. The remains of a small mine camp are located to the southwest on the opposite side of the road. In about a half mile the road gradually disappears and you wind up hiking a ways up a wash before you meet up with a donkey trail which continues up the wash to the ridge overlooking Water Canyon. The distance from the trailhead to the ridge is about 3.15 miles and the elevation at the ridge is 3515 feet. This is the highest point along this loop. From here the donkey trail continues mostly to the west and drops steeply into Water Canyon. You hit the bottom of the canyon at about 3.9 miles and at an elevation of 2840 feet. Hike down the canyon about 1.2 miles, passing a tunnel and an old cabin along the way, to the mouth of a side canyon going off to the south and located at an elevation of approximately 2550 feet. The donkey trail up the side canyon is pretty good, but has a few sketchy sections. About half way up the canyon, at about 2900 feet in elevation, an old road is encountered. Stay on the east side of the canyon and follow the donkey trail to the ridge (5.85 miles from the trailhead, elevation 3120 feet), where you reach the end of P2. Follow P2 to an old onyx mine. Continue on P2 until you reach P105 at 7.15 miles. Turn south onto P105 and proceed to the trailhead. 1. The main modification that can be made to this hike is the starting point. Over two miles of the hike follows P2 and P105 and there are plenty of good places to pull out (or to even camp) all along these two public roads. The unmarked road that goes up the unnamed canyon is probably not a legal route, although there are usually tire tracks along that road. The same goes for Sand Canyon. Tire tracks are usually visible in Sand Canyon, but it is highly probable that the BLM considers that a closed road and may ticket anyone it happens to find with a motorized vehicle in that location. 2. A quick hike up to the onyx mine and the shack up on the ridge adds less than a half mile to the total trip. The shack and the mine are worth a quick inspection and the view from the top of the ridge is also worth the effort.